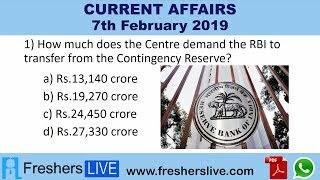 Current Affairs 7th February 2019: Instantly obtain Latest Current Affairs 7th February 2019 with all essential info, Be the first to know all the Current affairs 7th February 2019 top news, Major Issues, Current happenings, Important events in National as well as International level with clear explanation. For all competitive exams and Interviews, equip yourself with the Latest Current Affairs 7th February 2019 granted here. Air India chief Pradeep Singh Kharola appointed as Civil Aviation secretary. He will succeed Rajiv Nayan Choubey who retired on January 31, 2019, after the resignation he took over as a member in the Union Public Service Commission (UPSC). Air India’s First ever Flight Simulator knew as ‘Boeing 747-200’ was exhibited in Nehru Science Centre, Mumbai. The Simulator was acquired by Air India in 1980, which is designed and manufactured by the CAE(Canadian Aviation Electronics), Canada. The 21 years serviced Simulator is donated with a purpose to create awareness about the significance in the field of aviation among the public in general and students in particular.